$14.95 In stock. Order in the next 7 hours, 31 minutes and it will go out today! How can you make playing cards meaningful to even very young children? Make them fruity! That’s right! 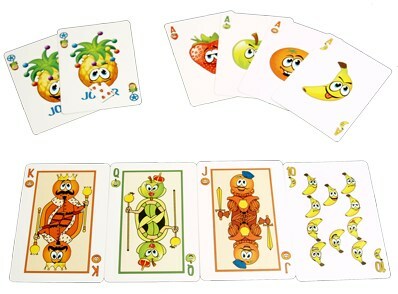 These cards substitute bananas, strawberries, green apples and oranges for the normal suits. This is a colorful deck that kids’ magicians will love! 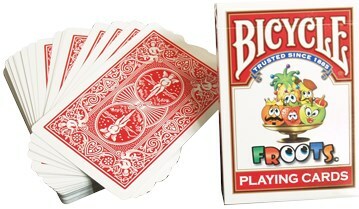 The deck is printed by USPCC in a red Rider-back design, so you know that you do all your sleight of hand with this Froots Deck. But creators Jean-Charles Briand and Yoan Tanuji took it a couple of steps further. The Jokers are giant pineapples. There’s a double-faced King of Oranges/Seven of Bananas. You also get two Three of Apples – one blue back, one red back.